Our little fella's first time to a costume party was a birthday party with a football jersey dress code. Then another birthday party where he had to wear a cowboy or Indian outfit. In school every now and then they have some festival celebration which is encouraged by wearing traditional attire. 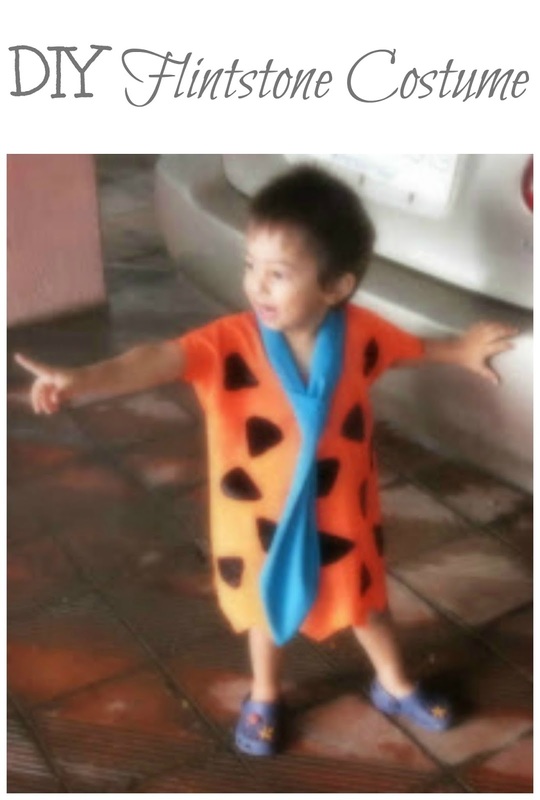 And the best ever time was his first Halloween costume party at school where I made him his Fred Flintstone costume! My first choice was The Hulk, although I knew it wasn't feasible - even if I painted his face green and made green clothes he would end up looking like Peter pan. The second option was The Hobbit, but I would have to hunt for individual items i.e. brown pants, vest,white oversized shirt, etc. Also I wanted something that could be handmade from scratch and had no face paint, hat, crown, accessory that he would discard immediately for sure. So Flintstone was the obvious choice! Easy to make, and the robe itself would be the complete costume! First I went to buy the material, orange, black and blue. Had I found em all in felt, it would've made things easier, but at least I found the black in velvet material. Then I stitched the basic orange robe after taking his measurements (it's a loose knee length robe so not much thinking to do! Plus he's still 2, so it's like making it for a doll!) and then stitched the tie. Had to hem the sides to avoid thread coming out but I let the zig zag ends be. Then I cut triangles with blunt edges out of the black velvet and stuck them all over the robe with fevicol. Voila! In a leisurely three hours the outfit was ready! We also had to send a small gift for all class mates that went into their Halloween treat bags (whistles, candies, etc I sent colourful foam balls!). So that was his last day of school before his two week Diwali vacation! So maybe in the years to come we'll be able to venture into more elaborate costumes (hulk, iron man, gandalf, who knows!) that'll be so much fun!